The legs of some of those killed at Brussels airport on Tuesday were shattered, as if the blast came from a piece of luggage nearby, an airport worker who helped carry their bodies said. 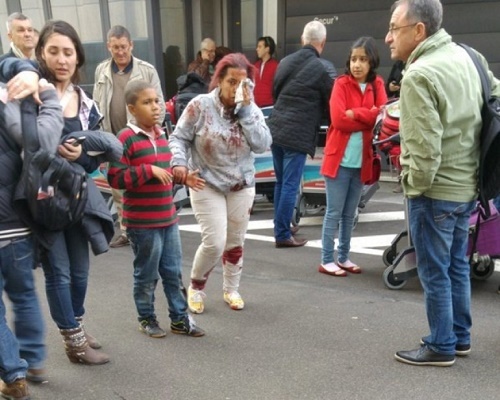 Alphonse Youla, 40, who works at Zaventem airport luggage security said that before the first bomb went off, he heard a man shouting something in Arabic. “Then the tiled ceiling of the airport collapsed. I helped carry out five dead, with their legs destroyed, as if the bomb came from a piece of luggage” he told reporters, his hands covered in blood. “It’s from the people I carried out”. Public broadcaster VRT said 81 people had been wounded at airport, many in the legs, suggesting a bomb in a bag on the floor. The federal prosecutor told a news conference one of the two explosions at the airport was likely to have been caused by a suicide bomber. At least 11 people were killed, before a further blast tore through a rush-hour metro train in the capital shortly afterwards, killing at least 15 people, public transport operator STIB said. Hundreds of passengers who had not been injured were leaving the airport by a side exit, many in tears, some covered with blankets. Many were being evacuated by bus. Passenger Paolo Saraca Volpini said an airport announcer’s voice came over the public address system about a quarter of an hour after the blasts, his voice breaking with emotion, and said in several languages “we are experiencing an attack” and asking people in Terminals A and B to stay where they were. One passenger, who had already cleared the security checks when the bombs went off, said that after the explosions, passengers already inside the airport panicked and started running in search of shelter. “People were taking cover in shops and where they could. We managed to get on the plane, but it did not take off and then we were escorted out to busses to leave,” said Sylwia Czerska, who was on her way to Geneva. Witnesses said the first explosion took place close to Belfius bank, near the lifts in the left wing of the departures hall. The second was stronger and was closer to the Starbucks cafe which is in the centre of the hall. Samir Derrouich, who works for the Autogrill restaurant at the airport, said of the explosions: “They were almost simultaneous. It was an apocalypse”.